This episode of Investing in Real Estate is sponsored by PropertyZar! PropertyZar is a property management software that provides affordable, user friendly solutions to real estate investors like you. Try PropertyZar for free by visiting propertyzar.com/morrisinvest. One of the most important pieces of establishing a route to financial freedom is figuring out a realistic and intentional approach to budgeting. We’ve discussed a few strategies here on the show about how we plan our family’s finances, but today we’re calling in a budgeting expert! Today’s guest is Eric Rosenberg, a personal finance writer and speaker. Eric runs a blog entirely dedicated to helping people manage their money, budget, invest, and start side hustles. On today’s show, Eric is sharing his approach to smart budgeting, using credit card rewards, and how to automate your savings. Today's show is packed full of personal finance tips—join us on this episode of Investing in Real Estate! Eric recalls always having a passion for finance. In fact, he earned the Personal Finance Merit Badge in Boy Scouts. He took business classes in high school, and went on to earn two finance degrees. Upon graduation, he started working at a bank where he was responsible for daily operations. Soon after, he began blogging about personal finance. Eric wrote about his personal experience, including how he paid off $90,000 in student loans in two years. Eventually, his blog and savings account allowed him to leave his full-time job as a Senior Financial Analyst. Eric is also passionate about teaching others how to manage money, including utilizing smart budgeting. Smart budgeting, he posits, is intentionally choosing how you spend your money. He suggests taking a look at your expenses, and eliminating the things you don't value. On today's show, Eric is sharing more about smart budgeting and using credit card rewards. We'll talk about why "keeping up with the Joneses" is often a fallacy, and how to automate how your finances work. 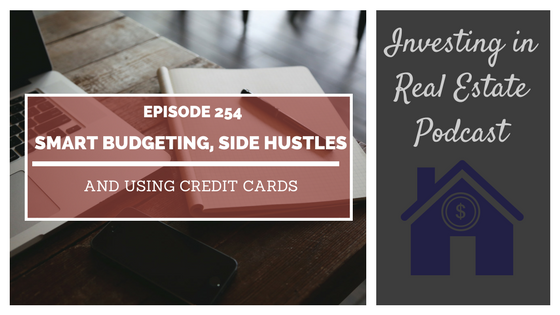 Eric is sharing some of his favorite credit cards and finance tools, and more! Don't miss episode 254 of Investing in Real Estate! BONUS EPISODE: Should You Prepay Your Property Taxes?